Are you looking to learn how to study in less than 15 minutes a night while scoring higher than ever? Smart Student Secrets is dedicated to teaching students around the world how to achieve better grades with less study time. So much of the traditional study advice is, not only wrong, but completely counter-productive to producing great grades. This blog focuses on dispelling those incorrect myths while spreading the most recent advances in studying strategies. Smart Student Secrets was born out of a number of smaller projects started by Aaron Richardson including Daily Memory Tips, Study Tips Daily, and this sites most immediate predecessor How To Study Faster. Aaron Richardson is the author of 3 best-selling books on studying listed below. He is also lives and studies using the same advice he gives in his writing. He graduated college in half the number of semesters as his peers. Through the process he worked a part time job to completely pay off his degree before he even graduated. He graduated near the top of his class in the process. He did this, not by using extraordinary intelligence, but by using extraordinary strategies. This is Aaron Richardson’s latest book. It includes 17 study strategies (that aren’t the traditional ones taught in school. In fact, many are highly controversial for the education establishment.) This book can help you get your grades up with less time and less effort. 100 Study Secrets rewrites the established advice for studying for the real world. The advice typically given by teachers is horribly wrong. 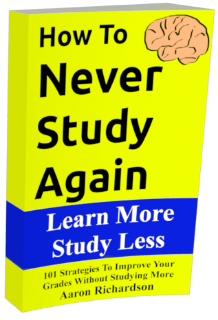 This book teaches all the dirty secrets that you need to know to take advantage of all the traditional study inefficiencies and use them to boost your own grades dramatically. While this book wasn’t intended for students at first, students ended up being some of it’s most veracious fans. This book teaches how to use your memory more efficiently and effectively. It includes a much deeper and more focused set of information to help understand memorization for studying. Kay is the woman responsible for most of what you see on this site. She’s the woman you’ll probably end up talking to if you contact us. Kay is a double major that spends her free time mastering the art of web development. She’s currently maintaining a 3.9 GPA at UME. Her favorite book is The Hitchhikers Guide To The Galaxy and she regularly envies the intelligence of dolphins. Kudos Smart Student Secrets reader!